Needing to have something in my hands to read the other day, I spotted a book of Thom’s (I think): “Oil!” by Upton Sinclair. It’s a Penguin edition with Daniel Day-Lewis’s picture on the front, because “There Will Be Blood” is “loosely based” on the novel. Fifty miles, said the speedometer; that was Dad’s rule for open country, and he never varied it, except in wet weather. Grades made no difference; the fraction of an ounce more pressure with his right foot, and the car raced on–up, up, up–until it topped the ridge, and was sailing down into the next little valley, exactly in the centre of the magic grey ribbon of concrete. The car would start to gather speed, and Dad would lift the pressure of his foot a trifle, and let the resistance of the engine check the speed. Fifty miles was enough, said Dad; he was a man of order. Far ahead, over the tops of several waves of ground, another car was coming. A small black speck, it went down out of sight, and came up bigger; the next time it was bigger yet; the next time–it was on the slope above you, rushing at you, faster and faster, a mighty projectile hurled out of a six-foot cannon. Now came a moment to test the nerve of the motorist. The magic ribbon of concrete had no stretching powers. The ground at the sides had been prepared for emergencies, but you could not always be sure how well it had been prepared, and if you went off at fifty miles an hour you would get disagreeable waverings of the wheels; you might find the neatly trimmed concrete raised several inches above the earth at the side of it, forcing you to run along on the earth until you could find a place to swing in again; there might be soft sand, which would swerve you this way and that, or wet clay which would skid you, and put a sudden end to your journey. So the laws of good driving forbade you to go off the magic ribbon except in extreme emergencies. You were ethically entitled to several inches of margin at the right-hand edge; and the man approaching you was entitled to an equal number of inches; which left a remainder of inches between the two projectiles as they shot by. It sounds risky as one tells it, but the heavens are run on the basis of similar calculations, and while collisions do happen, they leave time enough in between for universes to be formed, and successful careers by men of affairs. –More than 20 inches of rain has fallen. –The amount of water in the reservoir has increased by about one-third, from 1.41 million acre feet to 1.86 million acre feet. –The amount of the increase over just a month, 450,000 acre feet, is about enough water to supply 2.2 million people for a year. –But that’s not a lot in term of the demand for water here: About 80 to 85 percent of the “developed” water in California–water that’s impounded behind dams and delivered on demand to customers around the state–goes to farms. The rest goes to industry and residential users. The population of California is 36.5 million. I’ve got lots more numbers kicking around, but that’s enough for now. In the next installment–soon!–I’ll try to make some sense of them. 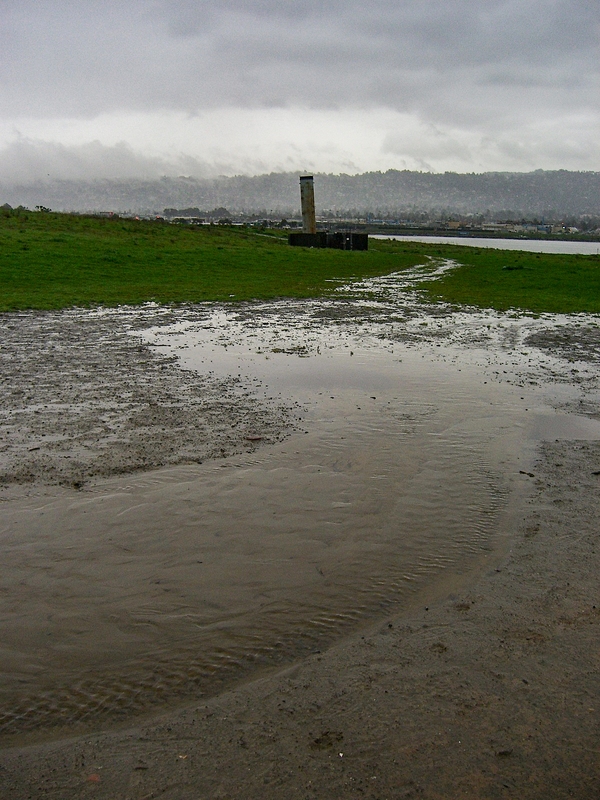 Standing water in the off-leash dog area at Berkeley’s Cesar Chavez Park. It started raining about midnight last night and kept up nearly straight through until 10 this evening. I’ve found lots and lots of weather sites online with scads of data to waste my time on, but I’ve never found the “official” Berkeley weather statistics online on a day to day basis; what I see from looking at local home weather stations and several other measurements around town is that we had about 2 inches of rain in the storm. Around the state, I’ve seen numbers over 5 inches along the northern coast and in some parts of the Coast Ranges. Three weeks ago, the universal description of this season was “California’s third dry winter in a row.” It could still turn out that way, but February has been a rainy month nearly everywhere in the state. 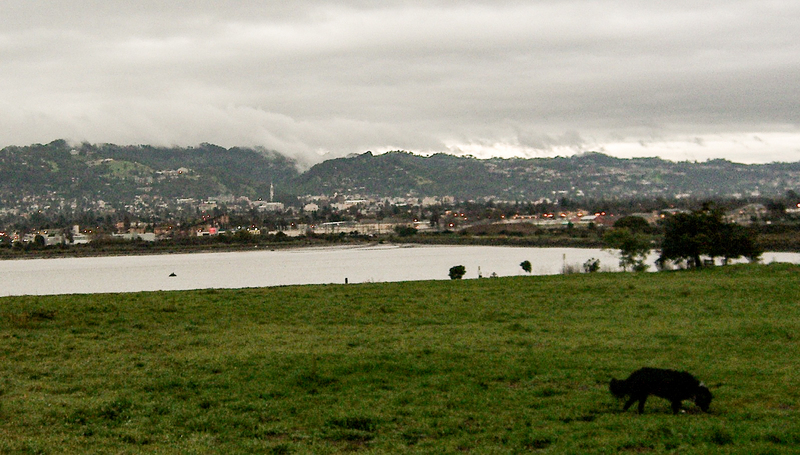 We had to get out for a walk this afternoon and decided to go down to the dog park near the Berkeley Marina. The rain chased almost everyone else away, and we got to slosh around by ourselves for half an hour or 45 minutes. The dog highlight of the day came when Scout spotted a jackrabbit on a knoll about 50 yards away. I saw him go after a rabbit once before, and it was a startling transformation from pet to hare-seeking missile. The same thing happened today: he turned into 55 pounds of flat-out speed and actually closed a good bit of the distance on the rabbit before it vanished into some brush and over a hilltop. Scout disappeared, too. He’s usually very controlled but from my earlier experience I knew he’d keep running as long as he had any sign that the rabbit was nearby. We ran after him and spotted him a couple hundred yards away in a meadow, looking around for us. The Netflix business model is brilliant if all customers are like us. We got a DVD of several Samuel Beckett plays (part of an Irish-British TV project, “Beckett on Film”) about a month ago and still have it. I don’t know — “The Wire” and even a reprise of “Band of Brothers” have gotten in the way. But Kate told me that the production of “Waiting for Godot” was great, so we put that on tonight while we waited for the rain to come. One nice surprise: Johnny Murphy, who played Joey “The Lips” Fagan, the trumpeter, in “The Commitments,” plays the tramp Estragon, one of the two main characters. Barry McGovern plays the other tramp, Vladimir. The set up to the little speech below–little, but one of the longest in the play–is a line from a character who twice passes through the tramps’ landscape. His synopsis of the human condition: “They give birth astride of a grave, the light gleams an instant, then it’s night once more.” That prompts a reflection from Vladimir. “Was I sleeping, while the others suffered? Am I sleeping now? Tomorrow, when I wake, or think I do, what shall I say of today? That with Estragon my friend, at this place, until the fall of night, I waited for Godot? That Pozzo passed, with his carrier, and that he spoke to us? Probably. But in all that what truth will there be? (Estragon, having struggled with his boots in vain, is dozing off again. Vladimir looks at him.) He’ll know nothing. He’ll tell me about the blows he received and I’ll give him a carrot. So: now we can send the DVD back. And just now, the rain started. After work, I walked from the radio station, at Mariposa and Bryant streets, over Potrero Hill, down to south of Market, all the way to the Bay, then up to the Oakland ferry. It’s about three and a quarter miles. The walk does lots of things, and one of them is to open up the city to view. 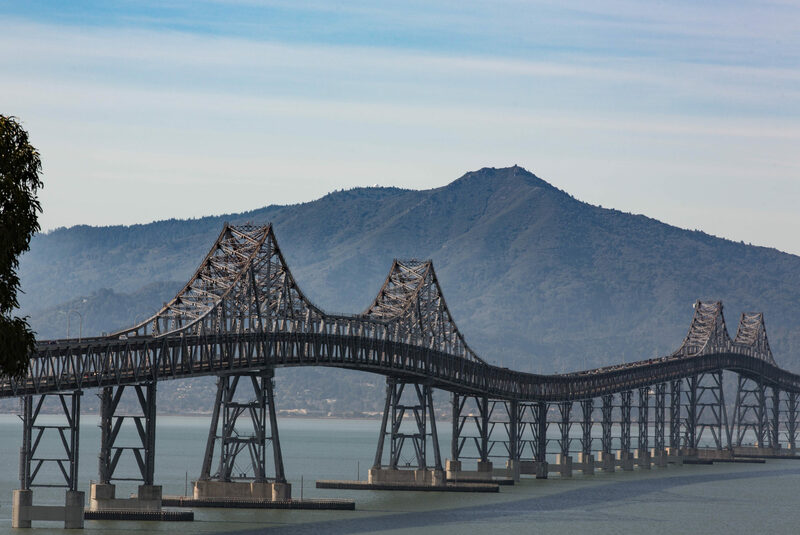 San Francisco is every bit as striking as self-conscious locals and awestruck visitors say it is. What I’ve come to like about it are the hard edges, the things that make the place a city rather than just a post-card vista: the Muni bus barn across the street from the station; Mariposa Street’s steep climb across Potrero Avenue; the way the 101 freeway cuts into the shoulder of Potrero Hill and sweeps beneath the pedestrian bridge between Utah Street and San Bruno Avenue; the view of downtown and the Bay Bridge from the hill; the way streets are flung straight up the hill, and all the rest of the hills, damn the contours; the shopping center on the site of the old Seals ballpark and the fact the ballpark was once there; the Double Play bar across the street from the same dead ballpark (I’ve never been inside); the giant phased electric classic Coca-Cola sign along the approach to the bridge; the bail-bond gulch across the street from the Hall of Justice; block after block of new lofts and flats that fill the old industrial district; the corner, 3rd and Brannan, where Jack London was born, according to the plaque there; the works and ramparts of the Bay Bridge where it’s built into bedrock and begins its thrust out over the water; the roar of traffic on the bridge, 15 or 20 stories above the bay shore, and everything else about the Bay Bridge, now that I think about it; the bayfront, for now anyway tamed and manicured and turned into a long promenade; the Ferry Building which I’ll always see with it’s cupola-top flagpole wrenched askew by the 1989 earthquake; and a thousand other things that I’ve seen, remarked to myself, and have forgotten until next time I come across them. And what I like most of all–that I’ve gotten a chance to walk through these places and am doing it still. Over the last 10 days, we’ve gone from a dry season, a sort of perpetual autumn, to full Northern/Central California winter. Which means: rain in the lowlands and someplace unseen, far to the east, the Sierra Nevada living up to their name. We have a storm parked offshore now, and the rain has fallen all day without much of a let up. We got out this morning to walk Scout during a break of an hour or so. But a couple of later excursions took place in a pounding-down rain, and the dog was soaked when we got back (he doesn’t seem to mind; and he seems to like the process of us toweling him down before we let him back in the house). Over in Davis this morning, just this side of Sacramento, Stage 1 of the Tour of California hit the road. The route was 107 miles to Santa Rosa over many of the same roads I’ve ridden on brevets, or centuries or just on rides with friends. The big climb of the day was up Howell Mountain Road. I remember it as a steep 2.5- to 3-mile grind I once did with my friend Pete. The eventual stage winner made one of his big moves on that climb today. I’ve ridden some of these roads in the rain, but today it looked like the racers got pelted from beginning to end of the stage. You see all everyone wearing rain jackets, shoe covers, tights, and what look like scuba gloves. None if keeps you dry. The longer you’re out in the rain, the more water you get in your shoes, the more sodden your shorts get, the colder you become. Of course, the elite pros in today’s peloton really raced today; it’s very, very rare for weather to interfere with the running of a race (one exception I remember: heavy snow in the mountain passes during a stage of the Tour of Italy maybe 15 years ago caused the race organizers to abbreviate a stage). They raced today, but they were miserable, just like the fraternity and sorority of just regular riding folks. More rain in the forecast tomorrow. And some patchy, wild roads, too, including another one I rode with Pete once: Tunitas Creek. It turns into a wild one-lane route through a redwood forest. When we road it, the road was all patches and patches on patches. I saw a report from a local cyclist today that the route had debris on it today. Which makes it kind of amazing to me that the best cyclists in the world are riding it. It’s more than a little like the Yankees showing up to play on your local diamond, complete with pebbles in the infield and potholes in the outfield. Seeing the best on your home field — well, it changes the way you see the field. Occasionally, once every couple of weeks maybe, I’ll drive in to San Francisco for my afternoon shift rather than take the train in. A midday the traffic is usually light and you zip across. And though it’s unnecessary to drive since I live and work close to transit, it’s nice every once in a while not to do the short hike down to the station at 16th and Mission at 9:30 or 10 at night. That’s another story. This afternoon the bridge approaches were clear as usual at 1 p.m. But the electronic sign at the bottom of the long incline after the toll plazas said there was an accident two or three miles ahead. Just ahead, the traffic was slowing, and it took a good 25 minutes to get up to the accident site on the west side of the tunnel that opens onto the suspension span that carries traffic into the city. Since traffic was just about stopped, I took out the camera and did some distracted driving. Lincoln Highway: Austin, Nevada. August 1, 2007. Lincoln Highway: Wanship, Utah. August 2, 2007. Just noodling around, looking for historical pictures of California for a possible project, I came across the Library of Congress stream on Flickr. Soon, I came across a series of slick, posed images of women at work during World War II in Los Angeles-area aircraft plants. I’m captivated by how much is going on here: high (for its time) technology, the serious industrial setting, the artful setup and shot, the costume, the war-on-the-homefront theme, the intensity of the worker as she does her job (not to mention the conceit that the man in the shot is instructing the little lady on what to do). The caption: “Women are trained to do precise and vital engine installation detail in Douglas Aircraft Company plants, Long Beach, Calif.” It was shot in October 1942 for the Office of War Information, our domestic propaganda agency, and credited to Alfred T. Palmer, the agency’s chief photographer. Click for larger image. Riding and racing for the pure joy of it: Canadian Rider Makes an Unorthodox Climb Toward Cycling’s Pinnacle. “Those who have heard the tale of Svein Tuft have wondered, could it possibly be true? “How he dropped out of school in the 10th grade, lured by the freedom of the outdoors. How he evolved into a barrel-chested woodsman with Paul Bunyan biceps. How he ventured, at 18, from his home in Canada into the wilderness on a $40 thrift-shop bike hooked to a homemade trailer.